Geometry practice test on circle, the questions we practiced and discussed under worksheets on circle are given here in geometry practice test. 1. Draw a circle of radius 2 cm. 2. Draw a circle of diameter 4.5 cm. (i) Centre of the circle. 5. Draw a circle whose diameter is 9 cm. Find its radius. (i) Half a circle is called a ………………………………. (ii) When the diameter is 10.8 cm, the radius is …………..
(iii) If the radius is 4.5 cm, the diameter is …………..
(iv) The distance between the centre and a point on the circle is called…………. (v) We name an ………………………………… by three points. (vi) The distance around the circle is known as………………… . 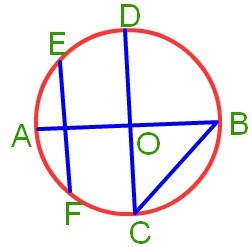 (i) Chord of a circle is a segment having its end points on the circle ............ .
(ii) All the radii of a circle are equal in length ............ .
(iii) If the distance of a point from the centre of a circle is more than its radius, the point lies in the interior of the circle ............ .
8. Draw a circle of radius 2.5 cm. Mark three points each. (i) In the interior of the circle. (iii) In the exterior of the circle. 9. Draw a circle whose diameter is 12 cm. Find its radius. 10. Draw a circle whose radius is 2.5 cm. Find its diameter.